Archives hosts a selection of papers, conference presentations, newspaper clippings and other publicatiuons which support the purposes of the ZelmerOz.com site. 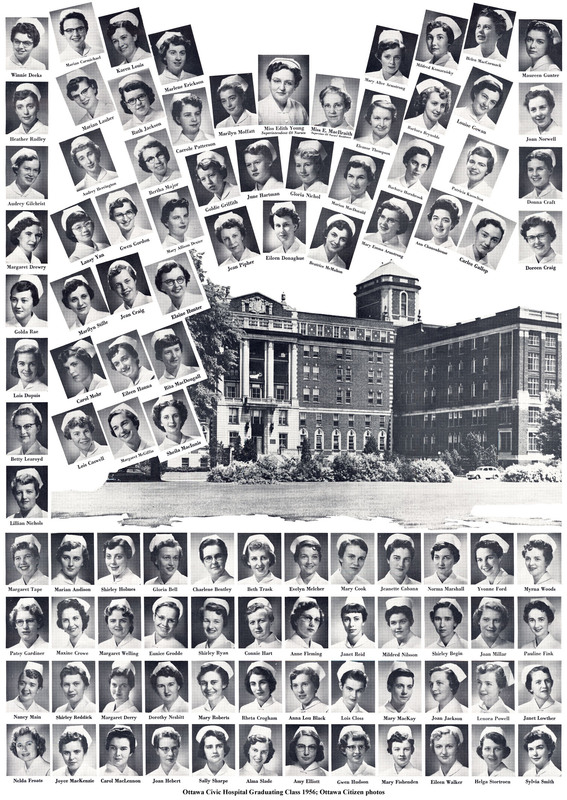 Ottawa Civic Hospital Nursing Graduates, Class of 1956, A3 size photo. Make Believe Railroading Flourishes at Coste House, Calgary Model Trainmen, in Calgary Herald Magazine feature, 31 August 1957. Model Train Show, captioned photo, Calgary Herald, 11 November 1960. Calgary Model Trainmen, Calgary Allied Arts Council layout plan drawn by AW Haynes, 1962. This is not likely the final plan as built. Calgary Model Railroaders, Transportation Past and Present: 1963 Annual Railroad Show brochure. 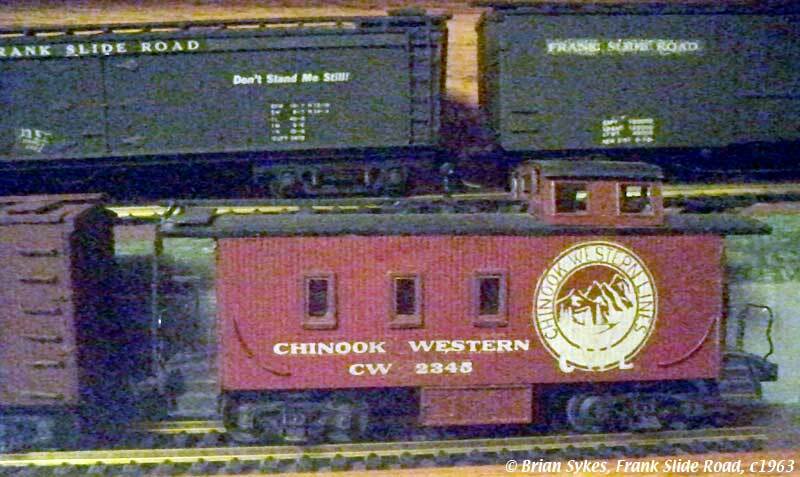 Chinook Western Lines caboose with Frank Slide Road equipment, HO model photo. May be on the original CWL layout, if so much earlier than c 1963. Affiliated South Bank Short Lines map, 'Serving the Rockies' (A4 from offset print, originally roughly A2 ammonia print drawn by Ross McIlveen). South Bank Short Line Association Official Guide, (from ammonia print). South Bank Short Line Association, Calgary, Bobber newsletter: November, December. South Bank Short Lines, Calgary (1964). Member's passes, front & back for 1964 membership. Zelmer, ACL (1964). 1963 Calgary Railroad Show (Transportation: Past and Present); The Dispatcher (7th Div, PNR): 26: Mar-Apr, pp 21-24. Zelmer, ACL (c 1964). Canintaco/Canadian Intermountain Co model railroad pass (exchange letter and pass). Zelmer, ACL (1964). Weathering Locomotives by Spraying; The Dispatcher (7th Div, PNR): 26: Mar-Apr (front cover) and 27: May-Jun, pp 10-13. Calgary Model Trainmen's Club: Certificate of tractive effort. Local Model Train Club Homeless After 17 Years, Calgary Model Trainmen, Calgary Herald article, 21 December 1965. South Bank Short Lines Association, Calgary, Bobber newsletter: 'Of Rails West' for the 1965 NMRA Convention, Vancouver, BC; and A4 Map of lines. Designing Model Railroad Passes, Canadian Intermountain Railways examples and Clinic Notes. Zelmer, ACL (1973). Draft Proposal for a Wildlife Refuge for SW 1/4 24-50-6-W5m and Pt NW 1/4 13-50-6-W5m. Proposal prepared for Wildlife Planning course #803, Department of Extension, The University of Alberta. This study and the example posters have been included here to illustrate development communications during this period. The study was very useful in my overseas work as a trainer/consultant on the development of basic/simple communication materials c1976-1982. National Development Service (1976). Communicating with Pictures in Nepal - Report of a study by NDS and UNICEF, Kathmandu, Nepal. National Development Service (1976). Communicating with Pictures - Summary Report of a study by NDS and UNICEF, Kathmandu, Nepal. Two example posters produced about this time: solar heater and food preparation. Zelmer, ACL (1979). Rail Transport Museum -- New Delhi, India, NMRA Bulletin, article with photos, March, pp 44-46. Zelmer, ACL (1980). Bibliography of published works, media, occasional papers, etc. Scanned from printout. Zelmer, ACL (1982). Preparing Simplified Training Materials, International Communications Institute. Training Booklet (reformatted from original, 568 Kb pdf file). Zelmer, ACL (1987). Pen and ink sketch of Sunderland Creamery 'Climax' locomotive (1910) converted to road vehicle with steam tractor type steering wheel. May still have been steam powered. Originally photographed at Sunderland, Ontario in May 1987. Zelmer, ACL (1989). Modeling a small Circus, NMRA Bulletin, article with drawing, June, pp 35-6. Zelmer, ACL (Editor) (1990, 2008). Learning Exercises for Health Training. A Manual of exercises developed with the Voluntary Health Association of India and others, now reformatted and released in electronic form. Full 96 page Manual (2.2 Mb). Individual components: Part 1: Foreword, Contents, Selecting and Using Learning Exercises (636 Kb); Part 2: Making Learning Exercises (520 Kb); Part 3: Selected Exercises (1.3 Mb). Zelmer, ACL (1992). Queensland Cane Railways, NMRA Bulletin, October, pp 26-28. Article with photos. Zelmer, ACL (1993). The Impact of the Introduction of Computers into the Faculty of Health Science: A case study of organisational change, University of Queensland, PhD thesis. PhD research study. Zelmer, A C Lynn and Lye, Ngit Chan (1994). Work in Progress: Multimedia for Diabetes. Paper presented at the 1994 APITITE Conference, Brisbane. Zelmer, A C Lynn (1994). Towards problem-based learning in computing: On-campus and at a distance. Paper presented at the 1994 HERDSA Conference. Zelmer, A C Lynn (1995). Pedagogy and pragmatics: Initial delivery of the BInfoTech degree on the Sydney Campus. Paper presented at the 1995 HERDSA Conference, published in Zelmer, A C Lynn (Ed) (1995). Research and Development in Higher Education, Vol 18 J-Z, Higher Education: Blending tradition and Technology, Jamison Centre, ACT: HERDSA, pp 794-799, ISSN 0155 6223. Zelmer, A C Lynn (1996). The more things change... memoirs of a computer-based educator, invited keynote presentation in Christie, Allan, et al, (Eds). Making New Connections, ASCILITE'96, Proceedings of the 13th Annual Conference of the Australian Society for Computers in Learning in Tertiary Education, Adelaide: The University of South Australia, 49-64, ISBN 0 86396 409 5. A personal reflection on thirty plus years of involvement as an educational technologist developing teaching and learning materials: presentation and paper (pdf). Zelmer, A C Lynn (Ed). Computer Basics for Health Practitioners 1996. Originally published by the Department of Mathematics and Computing, Central Queensland University, for the Australian Health Informatics Association (Queensland) Inc. ISBN 1 875902 34 1. Primer [large (585 K) pdf file]. Effective Multi-level Diabetes Education for Health Professionals: A 1995 CAUT-Funded Project. This CAUT funded project used an iterative design process which resulted in a prototype CD-based interactive multimedia package for diabetes education. The CD was distributed to nursing schools Australia-wide. 1996 Poster Presentation. Zelmer, A C Lynn, Lye, Ngit Chan and Pace, Steven (1996). Academics Developing Media Materials: Learning fron several cases paper from the 1996 Asia Pacific CHI Conference, Singapore as published in Yong, Lim Kee, et al (Eds). Human Factors of IT: Enhancing productivity and the quality of life, Proceedings of the First Asia Pacific Conference on Computer Human Interaction, Singapore: Information Technology Institute, 356-366, ISBN 9971 88 495 X.
Ulyatt, Jenny and Zelmer, A C Lynn (1996). A Case Study of One Computer and the Internet in a Long-Term Facility. A paper in McGuiness, Bill, and Leeder, Trish (Eds). Making IT Happen, Proceedings of the Fourth National Health Informatics Conference, Melbourne: Health Informatics Society of Australia, 209-212, ISBN 0 646 27360. Historical resources on the Alberta Coal Branch railway, Canada. This is a sample of a much more extensive research CD and was the basis of a 1997 NMRA/AR Convention Clinic and research paper. The selection includes the paper and notes on the development of the CD. Presentation. Zelmer, ACL (1997). 'Just-in-Time' Multimedia Systems: A Case study of on-line delivery of a first year teaching unit, paper in Kevil et al, What Works and Why: ASCILITE 97 Conference Proceedings, Curtin University of Technology, pp 652-658. Zelmer, A C Lynn and Stewart, Sharon (1998). Computers in the Faculty of Health Science--Five Years On. A paper presented to the HMIE Conference, 1998. Zelmer, A C Lynn and Zelmer, Amy E (1998). The Information Needs of Health Agency Board Members: A health information system challenge. A paper in Cesnik, B et al (Eds), MEDINFO '98: Proceedings Of The 9th World Congress On Medical Informatics, pp 1166-1169. Zelmer, A C Lynn (1999). Internet and Web Technology: On-line information strategies -- NO Free Lunch! These slides and their accompanying notes were delivered to the HISA/INTERACT '99 Health and Technology Conference in Melbourne, 2 Sep 99. Closing Keynote (pdf format). HISA, the Health Informatics Society of Australia, has further information on-line. Zelmer, A C Lynn (1999). Internet and Web Technology: On-Line Information Strategies. An introduction to using the web for HIC'99, the National Health Informatics Conference -- Hobart 1999. The links in the workshop exercises were active in later August 1999, they may have changed since. Workshop Guide. Zelmer, A C Lynn (1999). Developing Flexible Learning Materials. Experiences with two undergraduate multimedia units for on-line, CD-ROM and videotape delivery. Provides an indication of the challenges facing the Faculty of Informatics and Communication if it is to retain its momentum in this area. August 1999. Presentation (pdf format 1.4 Mb) and paper (pdf format 855 K). Zelmer, A C Lynn (1999). "Communication Skills Using Legal, Ethical and Professional Issues", in Fallows, Stephen and Ahmet, Kemal (Eds) (1999). Inspiring Students: Case Studies in Motivating the Learner, Staff and Educational Development Series, London: Kogan Page, Chapter 11, pp 95-102. A chapter on improving the communication skills of IT students. Abstract. Zelmer, A C Lynn, Ward, Sylvia and Cleland, Kathy (1999). The On-Campus and Distance Delivery of an Introductory 'Hands-On' Multimedia Unit Using Flexible Learning Materials. Abstract for a paper in the ASCILITE 1999 Conference Proceedings. Zelmer, A C Lynn (1999). EIP Vignette: Developing 00101 Introduction to Multimedia Systems; briefing paper for McNaught, Carmel and others (eds) (1999) Developing a Framework for a Useable and Useful Inventory of Computer-facilitated Learning and Support Materials in Australian Universities" Canberra: Evaluations and Investigations Programme Higher Education Division, Department of Education, Training and Youth Affairs. Zelmer, ACL (2000). Preliminary Results from a Pilot Survey of Occupational Overuse Syndrome (OOS) and computer use among NTEU members at Central Queensland University. Report (pdf). Zelmer, ACL (2000). Using New Information Technologies for Flexible Learning in Selected Papers Lifelong Learning Conference (edited by Dr Ken Appleton, Dr Colin Macpherson and Debbie Orr), Rockhampton: Central Queensland University, 17-19 July 2000, pp 263-269. Report (pdf). A4 sized 2003 calendars: ANGRMS, Bundaberg Garden Railways, CaneSIG. Zelmer, A C Lynn (2002). From Field to Mill: Modelling Cane Railways, from the 2002 Modelling the Railways of Queensland Convention (clinic notes - presentation, pdf files). CaneSIG: The Cane Railway (Tramline) Modelling Special Interest Group; 2001 annual report (pdf file). A4 sized 2004 calendars: ANGRMS, CaneSIG. Zelmer, Lynn (2003). Modelling Cane Railways, 4 page handout for the 2003 PNR 'Tunnel' Convention, Eugene, Oregon. Zelmer, Lynn (2003). A3 version (pdf file) of large scale interpretive poster prepared during the year for Australian Narrow Gauge Railway Museum Society (ANGRMS). A4 sized 2005 calendar: CaneSIG. Zelmer, Lynn (2004). A3 version (pdf file) of large scale poster in tribute to Nambour's Moreton Sugar Mill 1897-2003. Zelmer, Lynn (2004). Set of 13 A3 sized posters prepared as museum exhibition to commemorate Nambour's Moreton Sugar Mill 1897-2003 (Large -- 7.7Mb pdf file) and A4 colouring page with Moreton DH. A4 sized 2005 calendar: Singapore. ABV Perspectives, Spring 2005, short article on training project with Edwards Computer Foundation (ECF) in Vanuatu. Zelmer, ACL (2005). The Queensland Sugar Industry and its Tramways from the 7th Australian Narrow Gauge Convention, Albury. Paper (1.6 Mb pdf) and presentation (2.4 Mb pdf file). Zelmer, Lynn (2005). A3 version (pdf files) of large scale posters prepared during the year. Queensland Rail Heritage: ANGRMS -- Archer Park -- ASCR -- Bundaberg -- Mt Morgan. Sugar in Queensland: Field to Mill -- Victoria Mill. Zelmer, Lynn (2006). A3 version (pdf files) of large scale posters prepared during the year. Queensland Rail Heritage: CQ Heritage Group. Zelmer, ACL (2007). In The Public Interest - Researching & Promoting Narrow Gauge Railways from Eighth Australian Narrow Gauge Railway Convention - Melbourne. Paper (960 Kb pdf) and A4 poster (284 K pdf). Zelmer, ACL (2007). CaneSIG: Modelling Resources on the Internet, NMRA Australasian Region: Mainline, Summer 2007, 24:4, pp 9-11. Scan of newsletter article (776 Kb pdf). Zelmer, Lynn (2007). A3 version (pdf files) of large scale posters prepared during the year. Australian Narrow Gauge Convention: In the Public Interest. NMRA 2008 Convention (Brisbane) promotion. Zelmer, Lynn (2007). AATC Rockhampton tai chi poster. Zelmer, ACL (2008). Modelling the Unusual: Queensland's Sugar Cane Railways from Modelling the Railways of Queensland 2008, Brisbane, August. Paper and presentation (2.8 Mb pdf). Zelmer, ACL (2008). An Introduction to Modelling Queensland's Sugar Cane Railways (8 pages for b&w printer). Paper (1.4 Mb). Zelmer, ACL (2008). An Introduction to Modelling Queensland's Sugar Cane Railways from NMRA Australasian Region National Convention, Brisbane, September. (Eight pages b&w notes plus colour ppt slides and notes.) Paper and presentation (3.1 Mb). Zelmer, Lynn (2008). A3 version (pdf files) of large scale posters prepared during the year. Australian Sugar Cane Railway (Bundaberg): A Working Museum. Zelmer, Lynn (2009). Small Rolling Stock with Character, Paramatta: 9th Australian Narrow Gauge Convention, 6 pp paper and 40 slide ppt presentation (2 per page). Paper (1 Mb pdf file) and Presentation (4.5 Mb pdf file). Zelmer, Lynn (2009). A3 version (pdf files) of large scale posters prepared during the year. 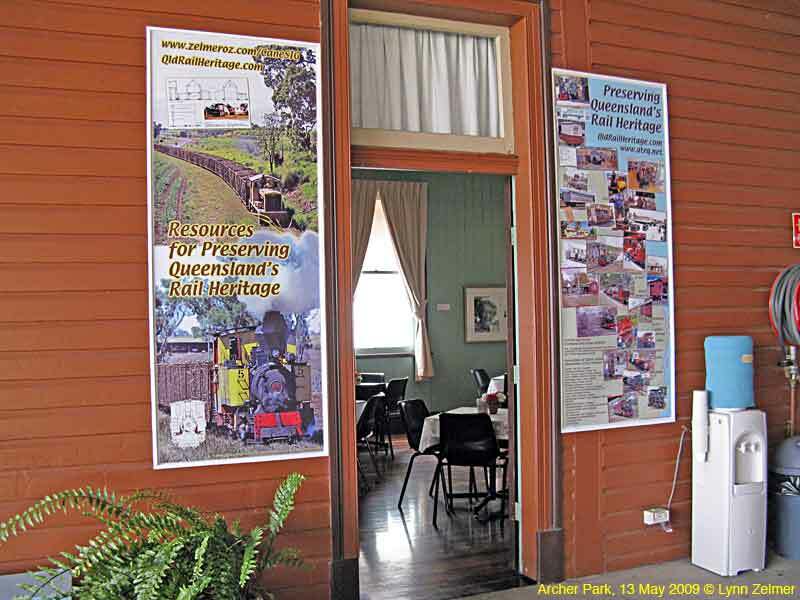 QldRailHeritage/ATRQ: Preserving Queensland's Rail Heritage -- Resources for Preserving...; and photo of posters on display at Archer Park Rail Museum. QRH/CaneSIG: Resources for Preserving... -- untitled model. Zelmer, Lynn (2010). Getting Started with On30, a four page A5 handout prepared for the Capricorn Sugar Rail Museum exhibition layout at the 2010 Brisbane Model Train Show. Zelmer, Lynn (2010).Cane Railway Modelling Resources: The CaneSIG Collection, Brisbane: Modelling the Railways of Queensland Convention, August 28, 2010. Notes and slides. Recent summary curriculum vita (resume), with selected list of publications and activities. 2010 CV: A C Lynn Zelmer (pdf file). Zelmer, Lynn (2010). A3 version (pdf files) of large scale posters prepared during the year. Capricorn Sugar Rail Museum: Getting Started in On30 (Convention Display). Zelmer, Lynn (2011). An Introduction to Computer-Based Modelling: The Workshops Rail Museum, Ipswich: 2011 Australian Narrow Gauge Convention. Clinic notes and slides [pdf 1.8 Mb file]. Zelmer, Lynn (2011). The World of Narrow Gauge Sugar Cane, clinic for the 10th Australian Narrow Gauge Convention. PPT slides [pdf 2.4Mb] and accompanying notes [pdf 2.5Mb, updated 2016]. Zelmer, Lynn (2011). Capricorn Sugar Rail Museum mini-poster for Australian Narrow Gauge Convention display with layout [pdf 213 Kb]. Originally each face was printed on A4 card and assembled on a three-sided hanging poster frame. Zelmer, Lynn (2011). A4 three fold stand-up exhibition display: Capricorn Sugar Rail Museum. Zelmer, Lynn (2012). Demonstration: Modelling an O Scale QR Camp Wagon , Brisbane: Modelling the Railways of Queensland Convention 2012 Convention (2 pages, 840 Kb pdf file). Photos of QR camp wagons can be found in the rail heritage image library using QRcw as a search term. Zelmer, Lynn (2012). Building a QR Cream Shed in O Scale in Australian Model Railway Magazine, August (909 Kb pdf file). Downloadable card model available free from http://qldrailheritage.com/mrqc. Zelmer, Lynn (2012). Modelling a Fettler's Shed, Narrow Gauge Down Under, #46 July (1.4 Mb pdf file). Downloadable card model available free from http://qldrailheritage.com/mrqc. Zelmer, Lynn (2012). A3 version (pdf files) of large scale posters prepared during the year. QldRailHeritage: Helping Preserve... poster 1 -- poster 2. These posters are displayed on the Archer Park Rail Museum station platform. Zelmer, Lynn (2013). Portable Track for Agricultural and Industrial Tramways, Melbourne: Australian Narrow Gauge Convention. Clinic notes (1.3 Mb pdf file), PPT presentation (1.6 Mb pdf file). Zelmer, Lynn (2013). Portable railway track for light railways, article in Light Railways 230, LRRSA, April, pp 12-19. Zelmer, Lynn (2013). Kitbashing a Photo-Realistic Card Model in the NMRA Australian Region 'Mainline' magazine, Summer. Zelmer, Lynn (2013). Modelling History, illustrated personal recollections/modelling autobiography (1.7mb pdf file). Zelmer, Lynn (2014). Research Resources for Modelling the Railways of Queensland, 2014 NMRA Australasian Region Convention: Selected Resources [pdf 815 Kb] and ppt slides [pdf 1.1 Mb]. Zelmer, Lynn (2015). Moving People on Queensland's Tramways, presented in absentia with recorded sound track at the 2015 Australian Narrow Gauge Convention: presentation slides (pdf file, no soundtrack) and clinic paper. Zelmer, Lynn (2012). A3 version (pdf files) of large scale posters prepared for the 2015 Convention. Moving People on Queensland's Tramways: scale drawings and selected photos. These posters are currently displayed on the Archer Park Rail Museum station platform. Zelmer, Lynn (2015). A3 version (pdf file) of large scale Helping Preserve... poster prepared for the Archer Park Rail Museum: Rockhampton city rail lines, 1947. 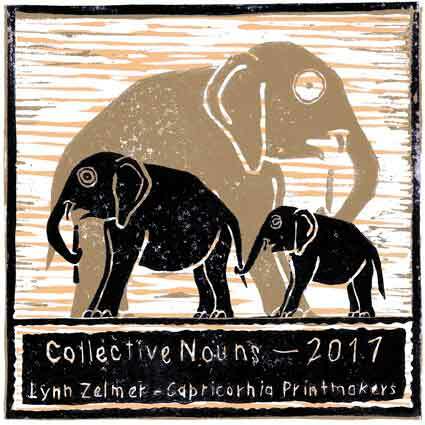 Zelmer, Lynn (2016). A3 version (pdf file) of large scale Helping Preserve... poster prepared for the Archer Park Rail Museum: Purrey Tram Restoration 1984-1988. Double Exposure II (2017): Double Exposure exhibitions partner a printmaker with a local photographer. My 2017 partner, Fran McFadzen, had recently been to Hanoi and was intrigued by its many interesting doors, grills, gates and building entries. We combined that interest with her photos of local doors and lanes to produce the Rockhampton and Hanoi posterised triptych print. More: Double Exposure II worklog with images. 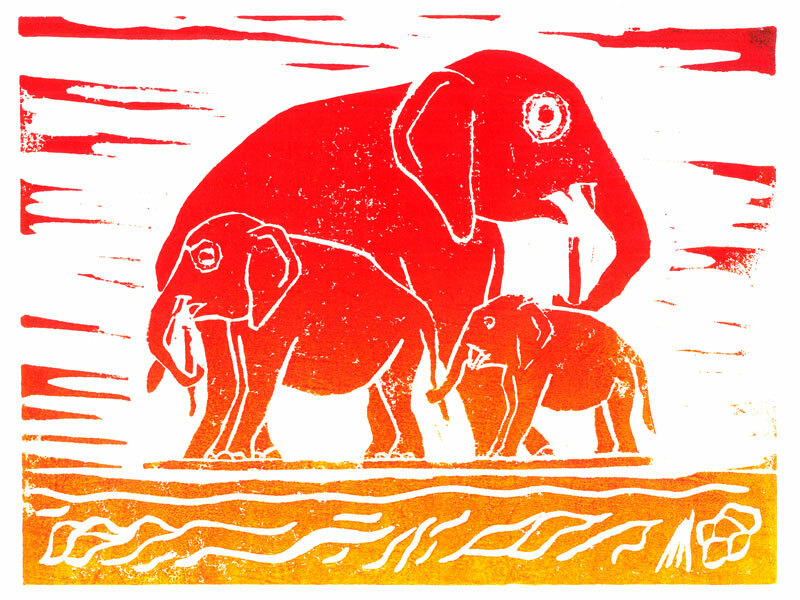 Psychedelic Pachyderms: A 2017 CPI project where I moved from my first linoprint in almost 50 years, a variation, to the 15cm x 15cm three plate exhibition print (from Artist's Proof). 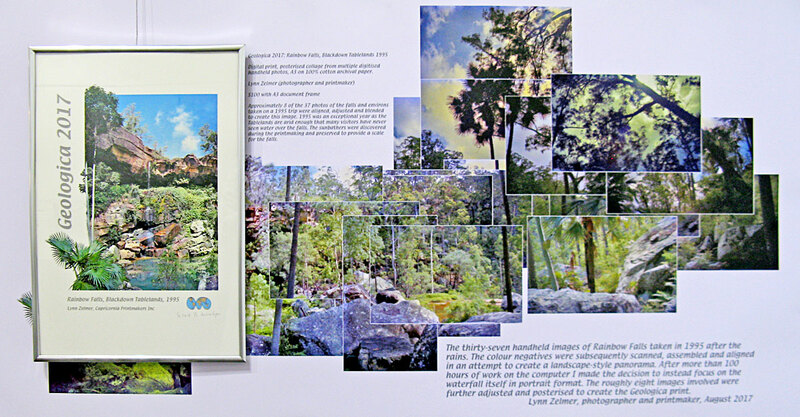 Geologica 2017: Capricornia Printmakers' 2017 themed exhibition -- my print, Rainbow Falls, Blackdown Tablelands 1995, aligned, adjusted and blended roughly 8 of the 37 photos of the falls and environs I had taken on a 1995 trip to create the framed image in this 120 x 60cm digital poster. 1995 was an exceptional year as the Tablelands are arid enough that many visitors have never seen water over the falls. The sunbathers were discovered during the printmaking and preserved to provide a scale for the falls. Poster. 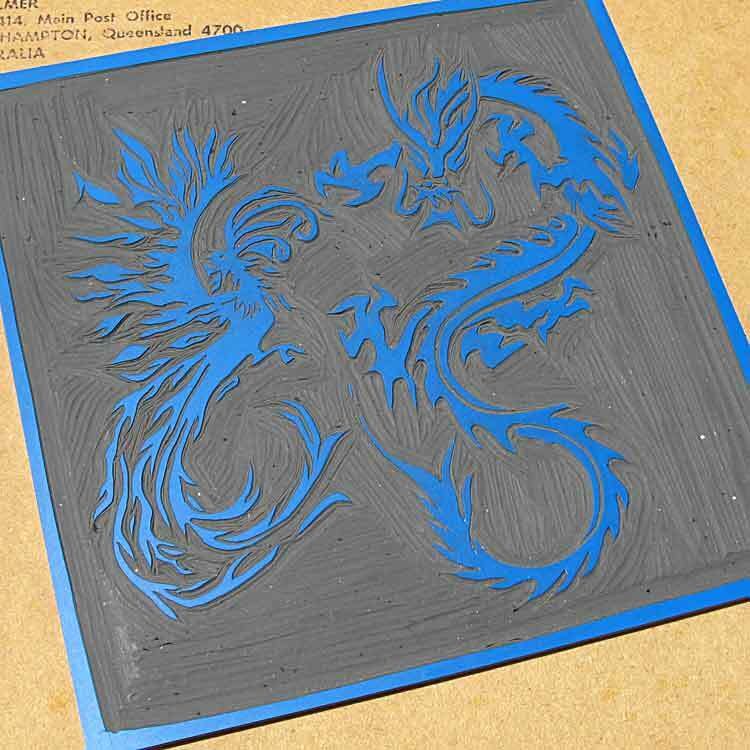 Origins: Walter Reid Centre Member's Exhibition (Feb 2018) -- Dragon and Phoenix lino block to be printed with yin-yang symbol in background and several colour variations. Promotional poster. Railway Workshops, Rockhampton: Interpretive poster (originally 600 x 900mm) using archival and modern imagery of QR's heritage listed railway workshops in Rockhampton, Queensland. 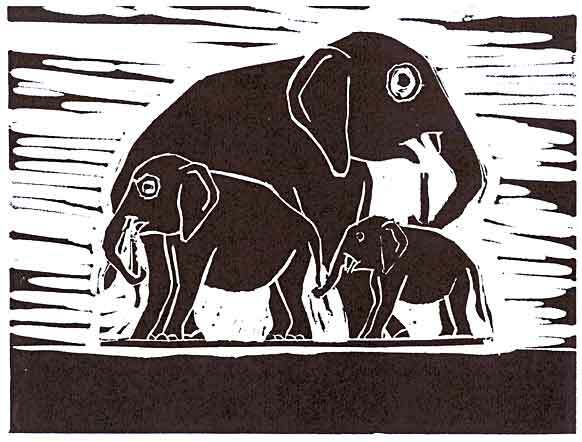 Archival images are from Railways of Australia NETWORK and the Jack Ilott Collection, modern images by the printmaker. Double Exposure III (2018): Double Exposure exhibitions partner a printmaker with a local photographer. My 2018 partner, Joan Tomkins, provided a selection of brolga images taken on a recent vacation. 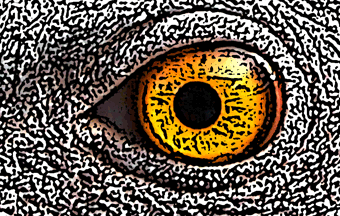 Our works focussed on one brolga's eye: exhibition print (A2 posterised digital print on acid free paper, edition of 1 based on 2017 photograph at Longreach), eye detail and promotional poster (image also used for greeting cards). 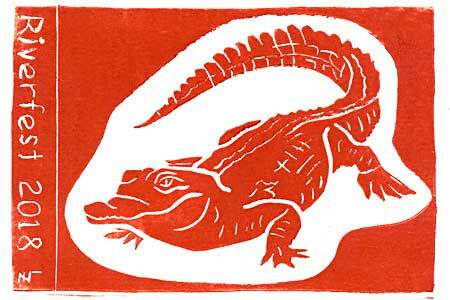 Riverfest 2018 (Rockhampton): Crocodile print from lino block for CPI free public workshop. 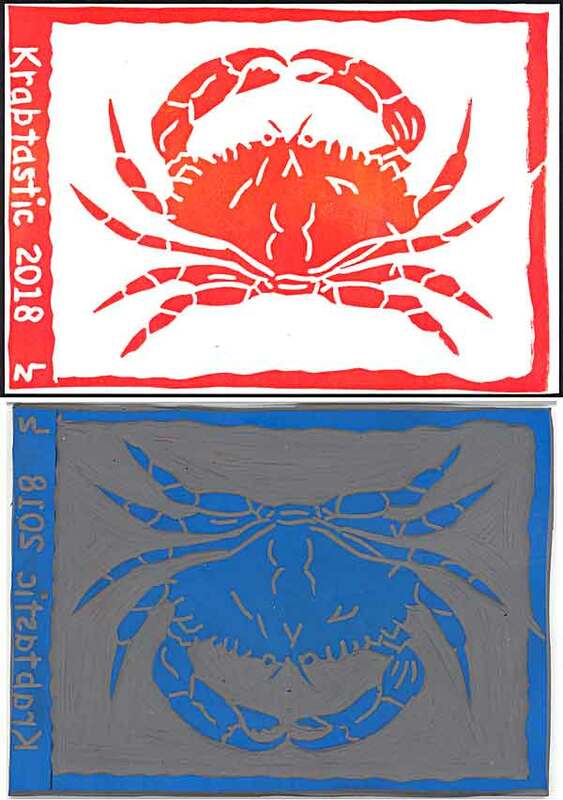 Krabtastic 2018 (Keppel Sands): Crab print and lino block for CPI free public workshop. Singularity: Walter Reid Centre, October 2018) -- Yeppoon Goods Shed; Decoupage (mixed media) on acid free media, frameless 50.8 x 25.4cm. An experiment using posterisation of low resolution images and photorealistic digital images on art papers. The project started with a promise to develop a model of the Goods Shed for a local model railway buff. Implementation involved researching the history of the railway precinct as well as exploring printing quality on a variety of acid free media. Zelmer, Lynn (2006-present). Index to over 50 magazine articles, primarily focussed on modelling Queensland's [sugar cane and Shire] tramways and wider gauge railways. Opinions expressed on this site are those of the author and do not necessarily reflect positions or policies of the author's employers or colleagues, past or present.